stylos: What drink was offered to Jesus on the cross? Image: Mosaic depicting a drinking game. Common soldiers, slaves, and plebeians of the lowest classes have a special beverage all their own, namely posca, which is simply vinegar mixed with enough water to make it palatable. It probably forms a really refreshing drink, if one can acquire the taste for it (p. 108). Posca was probably the drink in which the sponge was steeped, that was extended to Jesus as He hung on the cross. Matthew 27:34 They gave him vinegar to drink mingled with gall [oxos meta choles memingmenon]: and when he had tasted thereof, he would not drink. Matthew 27:48 And straightway one of them ran and took a spunge, and filled it with vinegar [spongon, plesas te oxous], and put it on a reed, and gave him to drink. Mark 15:23 And they gave him to drink wine mingled with myrrh [esmyrnismenon oinon]: but he received it not. Mark 15:36 And one ran and filled a spunge, full of vinegar [gemisas spongon oxouos] , and put it on a reed, and gave him to drink, saying, Let alone; let us see whether Elias will come to take him down (Mark 15:36). Luke 23:36 And the soldiers also mocked him, coming to him, and offering him vinegar [oxos] (Luke 23:36). John 19:29 Now there was set a vessel full of vinegar [oxous meton]: and they filled a spunge with vinegar [plesantes spongon oxous], and put it upon hyssop, and put it to his mouth. 30 When Jesus therefore had received the vinegar [to oxos], he said, It is finished: and he bowed his head, and gave up the ghost. 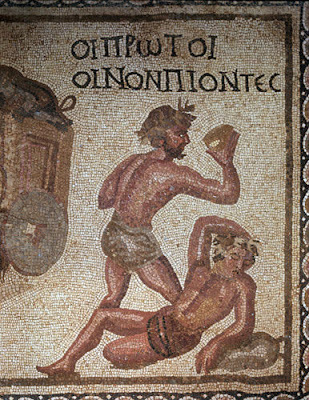 The offering of a vinegar drink (Greek to oxos, perhaps indeed, the posca mentioned by Davis) to Jesus at his crucifixion is mentioned in all four Gospels. It is multiply attested. Matthew and Mark are unique in that they mention two offerings and in their note of his refusal at the first offering. It is not implausible, however, to harmonize these with the other accounts. John notes the offering was just before his final statement, “It is finished” and death. Though noting the similarities in the accounts above, it should also be recognized that each account is unique. The closest parallels are between Matthew and Mark. Still, even the language of Matthew and Mark differ. Luke’s is the most minimal. This argues against the idea of literary dependence among the Gospels and toward independent development based on common tradition.